Lisbon seems to be having something of a moment right now. 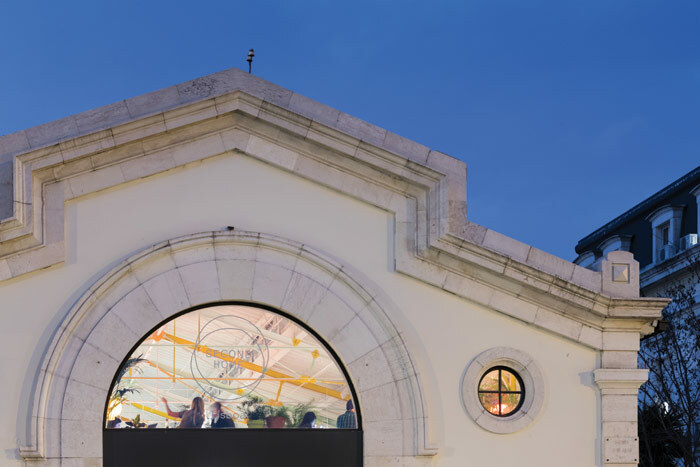 While the riverside regeneration of the old warehouse buildings along the river Tagus has seen Amanda Levete’s curvaceous new MAAT museum attempt to reconnect the old cobbled streets of the hilly historic city centre back to its waterfront, elsewhere in the Portuguese capital, a booming co-working culture and thriving tech scene is drawing arty types and innovative young entrepreneurs to stay. Attracted by the cheap cost of living, healthy lifestyle, open, liberal attitude, sunshine, surf and sea, fledgling start-ups have become the new normal here as the city reinvents itself into a vibrant, buzzing, creative hub. 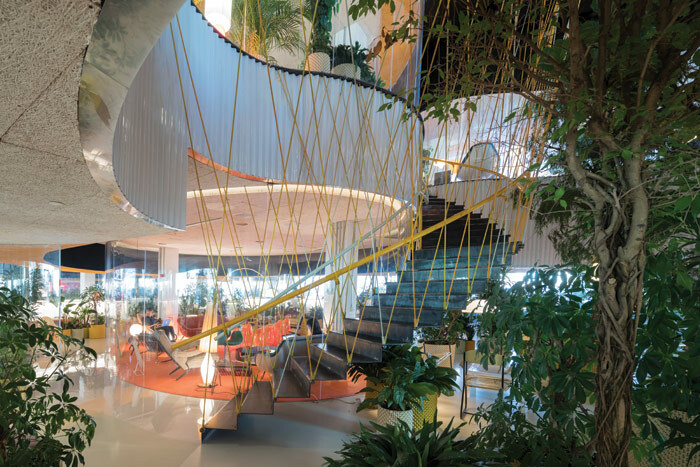 If the intention of MAAT was to give Lisbon an architectural icon like Bilbao, then the city’s blossoming start-up scene draws comparisons to Nineties’ bohemian Berlin or East London. Some are even calling it Europe’s California. Lisbon’s forward-thinking government is fostering this movement, freeing up constraints to attract a new generation of young talent and investors with start-up visas for students in foreign tech universities and reduced tax rates for start-up businesses. Startup Lisbon, a non-profit association, was founded in 2011 by the Lisbon Municipality to support companies in their first years with mentorship, investment and networking. Since then, huge technology conference Web Summit has relocated to the Portuguese city after seven years in Dublin, attracting more than 53,000 tech enthusiasts and 1,500 start-ups in 2016. 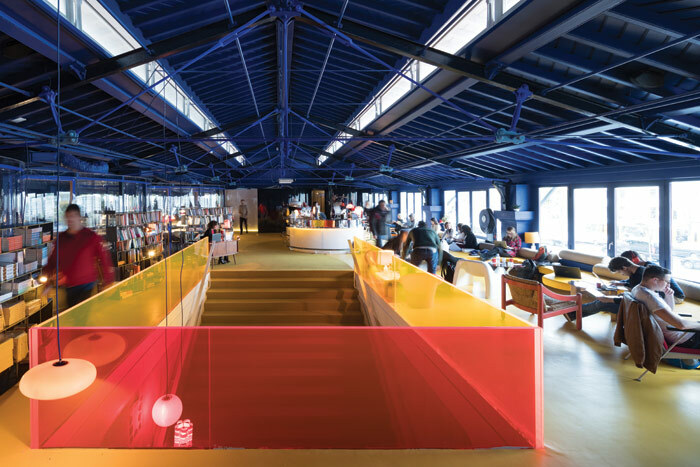 Co-working spaces have proliferated: there’s Village Underground Lisboa, housed in a cluster of old shipping containers and disused buses; Coworklisboa in a former industrial factory; and Lisbon WorkHub, which occupies a restored wine warehouse. This year the city is releasing an old army factory, the Manutenção Militar Complex, to become a Creative and Entrepreneur Hub for start-ups, companies and incubators (the subject of this year’s Docomomo 14th international conference on adaptive reuse). ‘Lisbon is a border city. This is where Europe ends and the world starts,’ enthuses João Vasconcelos, the secretary of industry for Lisbon and former director of Startup Lisbon. New to this scene is the second outpost of Second Home, a social enterprise and creative workspace provider that opened its first space in East London in November 2014. 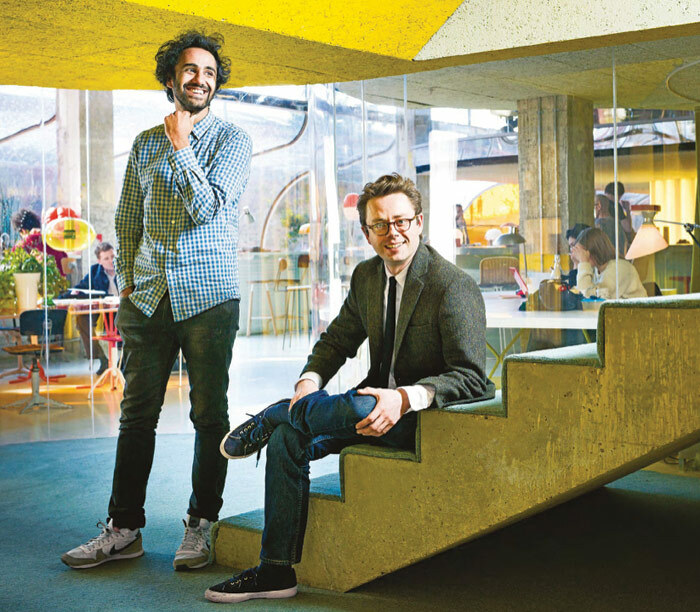 Founded by entrepreneurs Sam Aldenton, and Rohan Silva, former senior policy adviser to Number 10 and architect of the Tech City initiative, Second Home’s mission is to support creativity and innovation in cities around the world with radical architecture that fosters collaboration and wellbeing. It is privately funded, with investors including TV executive Sir Peter Bazalgette, former chief economist of Goldman Sachs, Jim O’Neill, co-founder of Jawbone, Alex Asseilly, and cofounders of M&C Saatchi Bill Muirhead and Jeremy Sinclair. 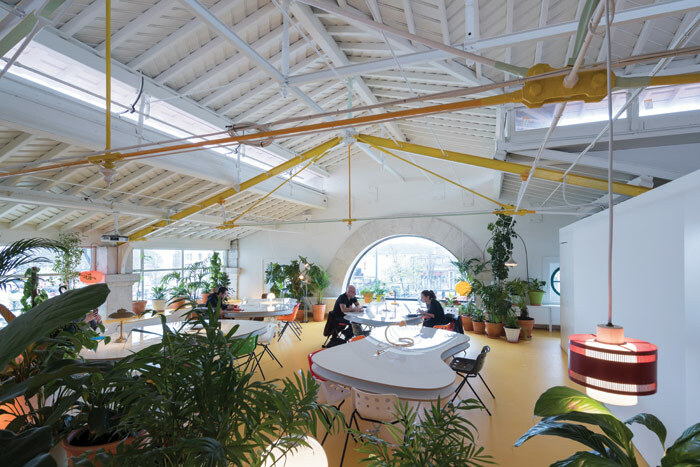 Together with Madrid-based architecture practice SelgasCano, Second Home transformed a former carpet factory off Brick Lane into a retro-yellow and orange-hued workspace with sinuous, transparent, plastic walls between studios, and filled it with vintage Eames chairs, 1,000 plants and the coolest kids in town. Unlike your standard, deadly dull office space, Second Home Spitalfields is more of a sociable meeting place akin to a members’ club, with a curated programme of talks, exhibitions, wellbeing schemes, live music and film screenings. There’s a restaurant and bar with an ex-Ottolenghi chef, and workers’ lunches each day. Teams renting the spaces are called ‘members’ and are carefully handpicked, ranging from tech companies such as Kickstarter and Taskrabbit, through British businesses Anglepoise and clean-energy company Bulb, to not-for-profit organisations such as the Syria Campaign and the new children’s museum for London, the Institute for Imagination. ‘We believe creativity and innovation best happens at the intersections of different domains, different industries and different disciplines,’ says Silva. ‘We think that something really special comes when people meet in the real world and collide with one another physically, and that is maybe quite an old-fashioned notion but it’s in pursuit of something very forward-looking. 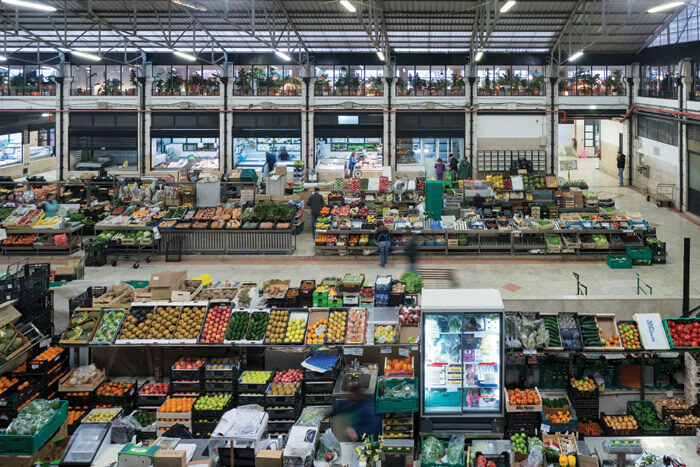 At the end of the space and round the corner, past the bar and the spaceship-like toilets, the long, open workspace runs parallel to the market below. The floors are bright, sunshine-yellow and the roof structure is white, with trusses highlighted orange and turquoise. A massive, white table (70 x 10m) twists and turns through the space, providing little pockets for different-sized teams within the larger whole. It’s designed to provide a balance between privacy and permeability, so teams can work quietly together in their dedicated spot, but connect and spark conversation with other disciplines as they move and walk around. It’s unlike any traditional office — there’s no draining, fluorescent strip lights, dehydrating air-conditioning units or unopenable windows here. 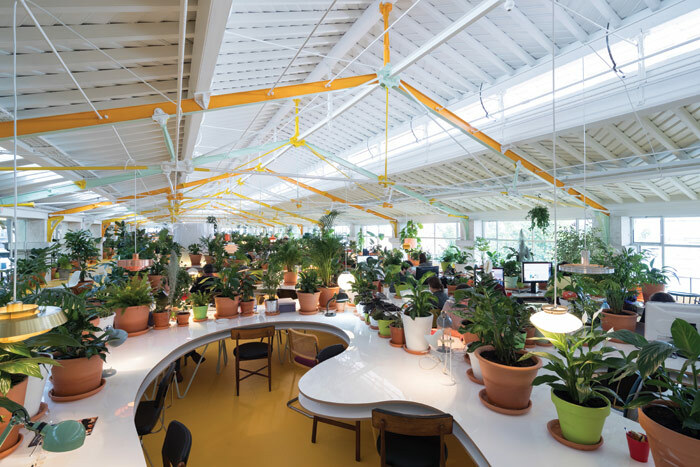 Inspired by the principles of biophilia, no vintage chair or pendant light in the space is the same, while desks are camouflaged by terracotta plant pots, concealing computer screens and workers within a dense, green, urban jungle. The many plants help divide the space and provide privacy for teams while reducing background noise and improving air quality. ‘We wanted to reflect the natural world. We do think it’s a shame that building and cities have become so standardised and homogenous, it’s very inhuman. We think that beauty comes from complexity,’ says Silva. ‘As a species we evolved in environments full of seasonality, plants, trees, natural light and variations in temperature, and all the empirical evidence suggests that being in environments that better reflect our natural world is better for our wellbeing, and therefore good for productivity and creativity.’ The spaces are heated and cooled by an advanced radiant system that uses cross-ventilation of air and 6km of under-floor pipework to create a comfortable, fluctuating base temperature that is always 9–10 degrees different to outside. As in Second Home Spitalfields, the teams are carefully chosen. There are three types of membership: resident membership with a dedicated, permanent desk; flexible, roaming membership with access to the communal workspaces for small teams and freelancers; and light roaming for after 5pm and on weekends. Teams range from two to 25 people and a space for roaming members offers 60 seats. The strong emphasis on wellbeing is not only visible in the physical environment of the space, but the curated programme too. As well as films, live music and talks, there are complimentary yoga and pilates, meditation workshops, a running club on a Friday lunchtime along the river and a surf school. It’s a wonder they get any work done when they’re not sipping flat whites or drinking (natural) Portuguese wine at the bar, mingling, mixing and meditating. But it’s all deliberate in its attempt to inspire and foster interaction. You can strike up a deal across the bar, a friendship at a yoga class, an investment during a talk. The suggestion is that you don’t have to be chained to your desk to be productive and progressive — this is more than just a workspace, it’s almost a way of living. Second Home is responding to the shifts in workspace design, from isolated cubicles and sterile, white boxes to responsive environments that adapt and shift with people’s needs, but it’s also responding to changes in business, helping young companies to reach their potential and survive beyond the first few years with new opportunities. Today, small- to medium-sized businesses, the focus of Second Home’s membership, are producing 60–70 per cent of new jobs in developed countries. They’re flourishing and office spaces haven’t really caught up yet to cater for them. Second Home has a role to play in not only providing great surroundings to work in, but supporting the changing needs of these young creatives and connecting them to the world outside the office walls. It’s more than simply adding a few pot plants to a space. ‘The reason we’re doing all this and are obsessed with creativity, is not because it’s a nice, fun, fuzzy thing. We actually think that creativity has a central economic and human importance in a way it wasn’t, even 20 years ago,’ says Silva. ‘In the Eighties and Nineties less sophisticated jobs were replaced in manufacturing by robots, and so in a sense technology replaced brawn. Second Home has flipped the office space on its head once, and now twice in Lisbon, and it will do it again. 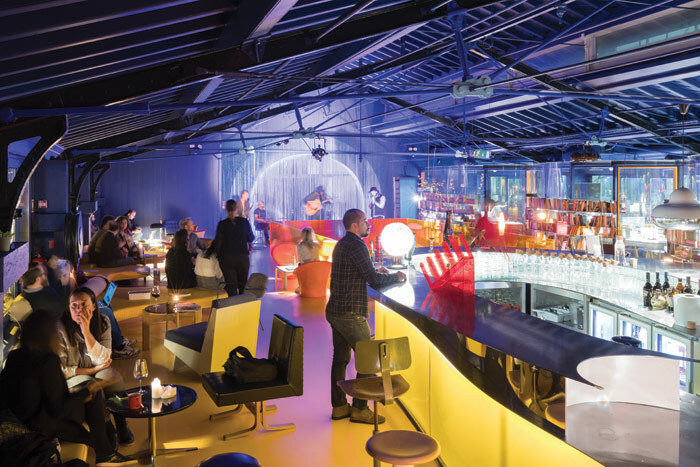 But unlike converted shipping containers or double-decker buses, slides through office floors and themed meetings rooms, Second Home is anything but gimmicky. It feels genuine, domestic and homely, from the architect’s painstaking sourcing of each of the retro lamps and armchairs from dealers from Cologne to Croydon, to the resident gardening team who tend all those plants. As technology frees us from more traditional office spaces and makes us mobile, paradoxically the more we seek out real connections, conversation and human contact. Second Home shows how workspaces, and cities too, can be more sustainable, more creative, healthier and happier.